CPS Disc Centrifuge, Models DC12000, DC18000, DC20000 and DC24000 - the world's fastest, highest resolution, and most sensitive centrifugal sedimentation particle size analyzers. Measure virtually any type of particle, between 0.01 and 50 microns, at 2 to 10 times better resolution than any other particle sizing instrument, regardless of measurement technique. The minimum reportable peak width can be less than 2% of peak diameter. 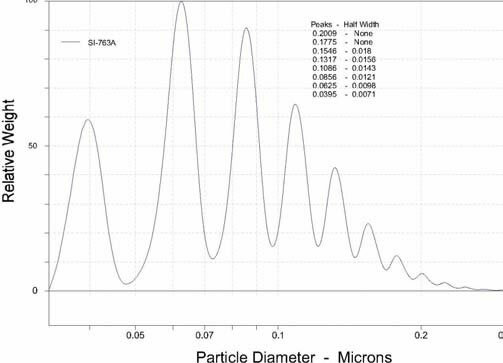 Particle size Calibration Standards - 0.15 micron to 165 microns peak size; distribution widths of +/-9% of peak diameter to +/-2% of peak diameter. 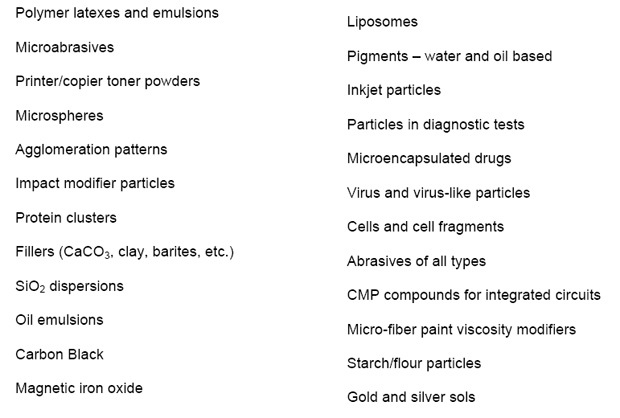 Particle size analysis service for samples in the 0.01 micron to 100 micron size range. The CPS Disc Centrifuge is a complete, high resolution particle size analysis system for measuring particles in the size range of ~0.01 micron to ~50 microns. The instrument separates particles by size using centrifugal sedimentation in a liquid medium. The sedimentation is stabilized by a slight density gradient within the liquid. The particles sediment within an optically clear, rotating disc. 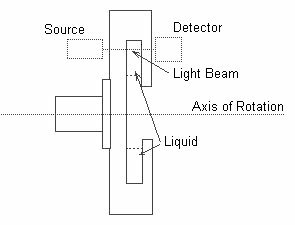 When particles approach the outside edge of the rotating disc, they block/scatter a portion of a light beam that passes through the disc. The change in light intensity is continuously recorded, and converted by the operating software into a particle size distribution. 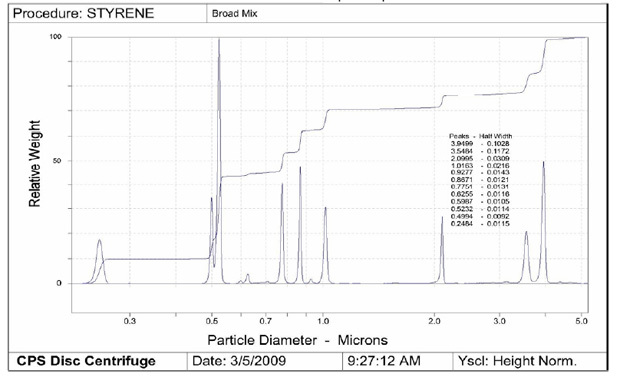 Are Your Particle Size Results Real? 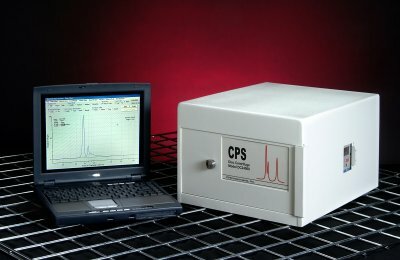 Get realistic results with CPS Particle Size Analyzers. 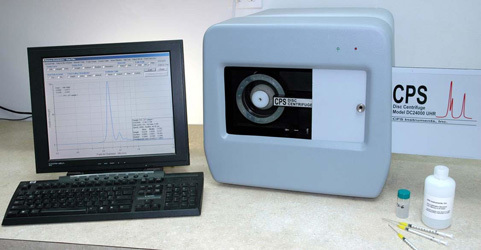 The CPS Disc Centrifuge can be used to measure virtually any particulate material between <20 nm and 40 microns. The CPS Disc Centrifuge measures particle size distributions using sedimentation in a fluid, a well known and reliable method of particle size characterization. Particles settle in a fluid under a centrifugal field according to Stokes' Law. Sedimentation velocity increases as the square of the particle diameter, so particles that differ is size by only a few percent sediment at significantly different rates. In differential sedimentation, all the particles in a sample begin sedimentation as a thin band. If all the particles are of the same size, then they settle at the same speed and arrive at a detector beam as a thin band. The time needed to reach the detector is used to calculate the size of the particles. A broad distribution of sizes spreads out during sedimentation into a broad band, while a mixture of different narrow size families of particles separate into separate narrow bands, each of which arrives at the detector at a different time. Particles between <20 nm and >40 microns can be measured; the actual size range depends on the the difference in density between the particles and the fluid, as well as the maximum speed of the centrifuge. The CPS Disc Centrifuge can routinely resolve (that is, physically separate) particles that differ in size by less than 5%, and with the new Ultra High Resolution models, the instrument's resolution is better than 1.5% for most samples. Unlike other particle characterization instruments, the CPS Disc Centrifuge UHR yields distributions that are essentially free of distortion from the measurement method; the reported distribution is a nearly perfect representation of the true distribution. The CPS Disc Centrifuge yields accurate, high resolution results, even with non-ideal samples that completely mislead other particle sizing methods. The size distribution graph below shows two narrow polystyrene peaks with mode diameters of 519.5 nm and 497 nm. These peaks differ by only 4.4%, yet are clearly resolved. Most of the width of the two peaks and most of the overlap between them is due to the physical width of the peaks, not due to the measurement. Perfectly narrow peaks (if these existed) would be reported with a total peak width of less than 1.5% of the mode diameter. This is the "minimum reportable peak width" and is the best measure of the resolving power of a particle size analyzer. No other particle sizing instrument comes close to the resolution of the CPS Disc Centrifuge UHR. All analyses are run against a known calibration standard, so high accuracy is assured. Calibration can be either external, where the calibration standard is injected before the sample is measured, or internal, where some calibration standard is mixed with the sample prior to measurement. Typical precision of reported sizes with external calibration is +/- 0.5% (95% confidence), and with internal calibration typically +/-0.25% or better. Routine measurements can be run on samples as small as 10-6 gram total particle weight. Narrow peaks are detectable at well below 10-8 gram, so trace quantities of one size mixed with a large quantity of a different size can be accurately measured. The CPS Disc Centrifuge uses speed ramping to extend the dynamic measurement range (the ratio of largest to smallest diameter). Dynamic ranges of up to 1,000 are practical with speed ramping. 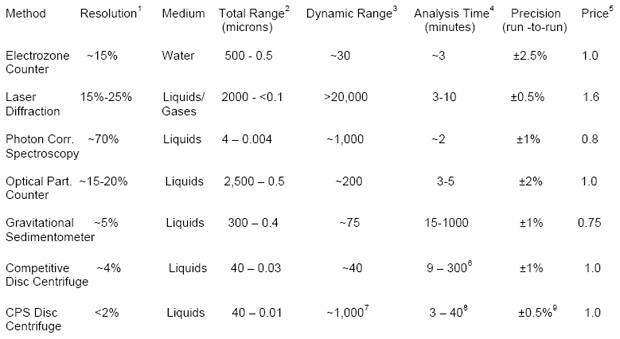 The table below shows how the CPS Disc Centrifuge compares in some important characteristics with other particle sizing methods. In cases where more than one competitive instrument of the same basic type is available, typical performance values are used. The CPS Disc Centrifuge offers an exceptional combination of resolution, operating range, and measurement accuracy, at a competitive price. 1. Resolution is the minimum difference in size between two perfectly narrow peaks that allows 95% separation. 2. Total range is largest practical size to the smallest practical size. 3. Dynamic range is the ratio of the largest to smallest size in a single analysis. 4. Analysis time is total time sample to sample. 5. Relative purchase price without optional equipment. 7. With speed ramping; maximum for fixed speed is ~70. 8. Maximum dynamic range for a 10 minute analysis is ~100. The CPS Disc Centrifuge is designed for long life with low maintenance. The instrument has a minimum of moving parts: the drive motor, disc, cooling fan, and door lock. The instrument is mechanically robust and durable. The motor bearings are permanently lubricated ceramic/steel hybrids, with a projected life well in excess of 10,000 hours at 24,000 RPM, and almost indefinite life at lower speeds. All electronic components operate at less than 70% of rated capacity, to insure extra long life. There is no scheduled maintenance except to clean the disc after use and change the cooling air filter each several months. that fails in normal service. 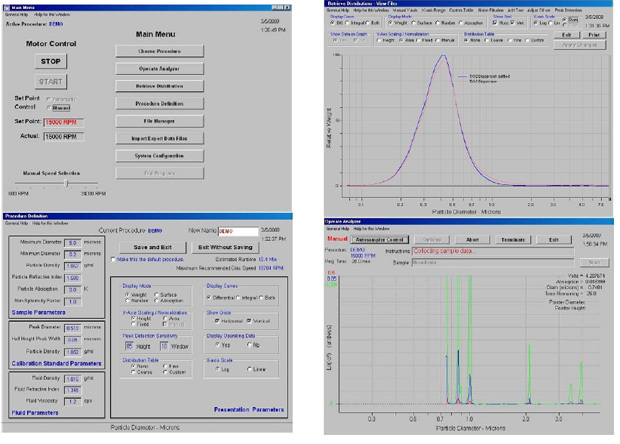 The software also controls the CPS Autosampler, allowing completely unattended operation, with a total of 20 automatic injections (calibration standards and samples). The screen images below show some typical windows within the software. The software runs on any Windows version, but XP or later is recommended. Why does the CPS Disc Centrifuge produce the most accurate size distribution? Because it uses the best technology! 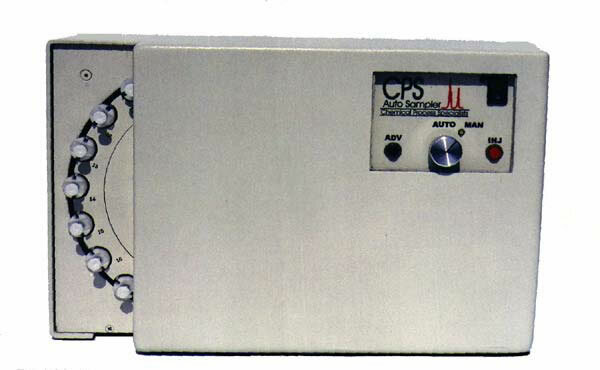 The CPS Disc Centrifuge operates at up to 24,000 RPM (approximately 29,000 g-force). Analyses of very small particles are completed three or more times faster than competitive disc centrifuges. Analyses of samples with relatively broad distributions, which are impractically long on competitive sedimentation instruments can be measured rapidly with the CPS Disc Centrifuge. Higher maximum speed reduces the minimum measurable size for all types of samples. The CPS Disc Centrifuge is always calibrated against known size standards. Calibration can be done using internationally recognized, traceable standards, or can be done using your organization's internally recognized standards. You can add a trace of calibration standard to an unknown so that the measurement is internally calibrated. Internal calibration yields typical measurement variation of less than 025% from run to run, day to day, and between different instruments. Differential sedimentation has historically been limited to particles that are more dense than the fluid in which they are suspended. 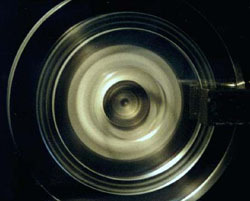 CPS uses a patented method (US 5,786,898) where the sample is delivered to the bottom of the disc chamber, rather than to the surface of the fluid. This technique allows particles that are lower in density than the fluid to float toward the fluid surface during analysis, following the same Stokes' Law sedimentation as high density particles. Even neutrally buoyant particles suspended in water can be measured by conducting the analysis in deuterium oxide (density 1.108) instead of water. Materials such as oil emulsions, wax emulsions, adhesive latexes and liposomes, which were impossible to measure by differential sedimentation can now be measured easily. CPS uses two removable "disc inserts" to effectively partition the disc chamber into two separate chambers. This allows the speed of the disc to change during an analysis, without disrupting (mixing) the the fluid inside the disc, which would make analysis impossible. The speed can be ramped up and down over a 20-fold range without disrupting the fluid. A 20-fold range of speeds increases the dynamic range of the measurement by a factor of 20. Other disc centrifuges are limited to a practical dynamic size range of ~40, but the CPS Disc Centrifuge can measure over a dynamic range of up to 1,000. Extremely broad samples that historically have been measured by other methods can be measured with the CPS Disc Centrifuge, but at much higher resolution than those other methods. 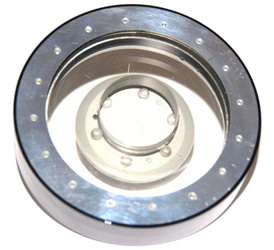 The light source and electronics in the CPS Disc Centrifuge are designed to minimize electronic noise in the signal. Typical background noise is less than +/- 1 part in 100,000 over 30 seconds. Very low noise in the signal yields very high sensitivity. High resolution measurements of many kinds of samples at sub-microgram levels is routine. The CPS Disc Centrifuge supports optional automatic sample injection and an automatic gradient builder. The automatic sample injector allows unattended operation, with up to 20 injections of calibration standards and samples pre-programmed. The usable signal resolution (what the software works with) is only as good as the analog to digital (A/D) conversion process. The A/D conversion in the CPS Disc Centrifuge is better than 20 bits, at 31 readings per second, or better than 1 part in 106.
recorded by the detector. The ability to accurately record rapidly moving peaks expands the practical dynamic range, by allowing larger particles to be measured at higher speed. With the introduction of the CPS Disc Centrifuge UHR models, CPS sets a new standard for resolution in particle analysis. Fine details of the distribution are revealed; details that are completely invisible when the same sample is measured using other particle characterization methods. Users who have experience with other methods are often surprised by what they learn about their samples when measured by the CPS Disc Centrifuge. The above SiO2 sample came from a continuous reaction process. Based on SEM analyses, it was expected to have a single broad peak centered near 90 nm..... not 11 separate peaks.